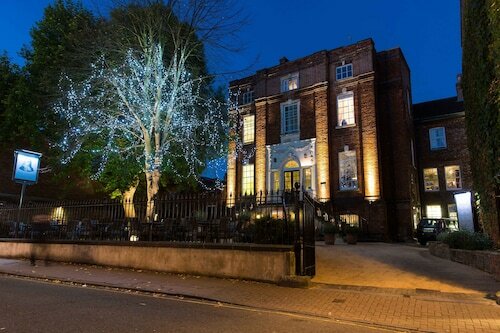 This family-friendly York hotel is located in the historical district, within 1 mi (2 km) of Goddards Garden, York Racecourse, and Bar Convent Museum. York Station is 28 minutes by foot. 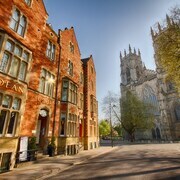 Located in the heart of York, this hotel is within a 15-minute walk of Bar Convent Museum and Jorvik Viking Centre. Shambles and York Racecourse are also within 1 mi (2 km). York Station is 9 minutes by foot. 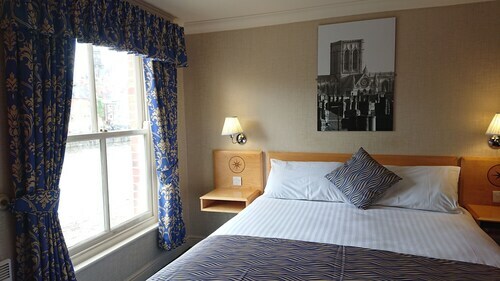 Located in the heart of York, this inn is steps from Bootham Bar, York Minster, and York Theatre Royal. Shambles and York St. John University are also within 10 minutes. York Station is 11 minutes by foot. 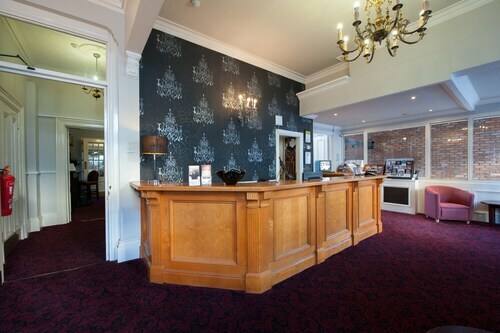 Situated in York, this hotel is within a 15-minute walk of Bar Convent Museum and York Racecourse. Shambles and York Minster are also within 1 mi (2 km). York Station is 14 minutes by foot. 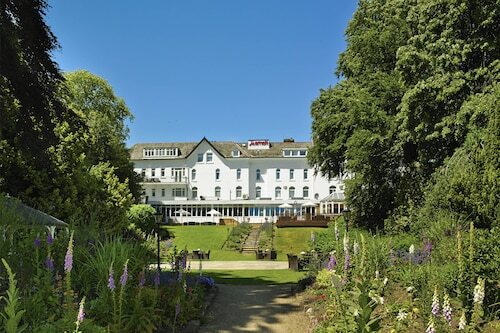 Set amid manicured grounds, this handsomely renovated Victorian hotel is next to the main railway station and within 0.7 km of the National Railway Museum, York Dungeon, and the Gothic York Minster. 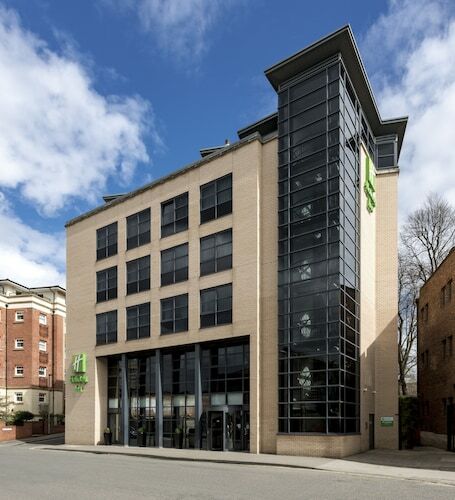 Situated in the business district, this luxury inn is steps from York Guildhall and York Theatre Royal. York Minster and Shambles are also within 10 minutes. York Station is 8 minutes by foot. 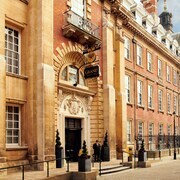 Hotels in York start at $47 per night. Prices and availability subject to change. Additional terms may apply. 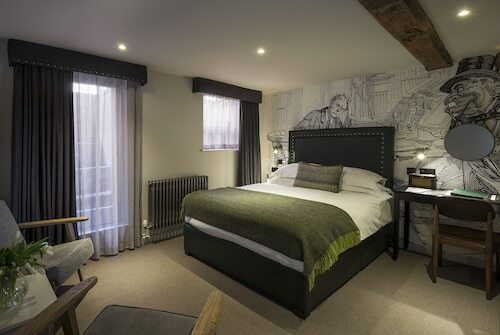 Visitors to North Yorkshire are in the ideal position when it's time to start researching great accommodation in York. Right now, Travelocity's extensive and up-to-date database features 38 places to base yourself within a 6-mile (10-kilometer) radius of York's center. The Thompsons Arms B&B is the nearest Travelocity-listed accommodation option to the middle of York and it's simply a quick drive away. Students, families and thrifty travelers will find some nice York lodging options that won't blow holes in their budget. The Thompsons Arms B&B is 1 mile (2 kilometers) from downtown, while the The Black Bull is 12 miles (20 kilometers) away. Some more budget-concious options in York include the Forresters Arms Hotel - Inn and the Monkgate Guest House. 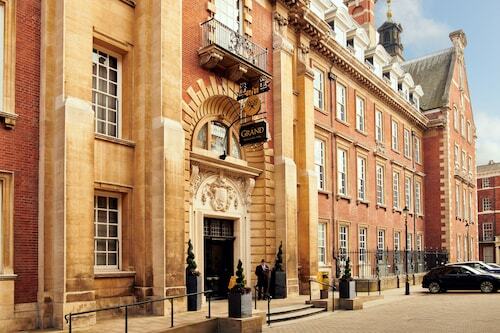 Look into the Grays Court as well as the The Grand Hotel & Spa. 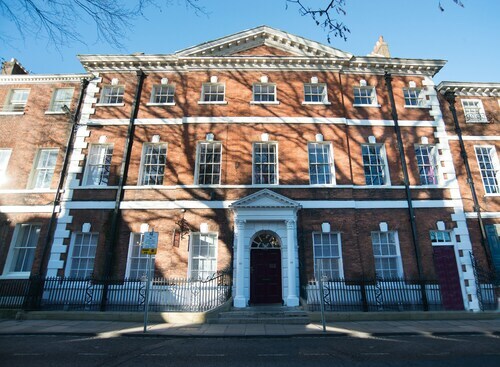 The Grays Court is located only 7 miles (11 kilometers) away from the town center of York. The The Grand Hotel & Spa, is positioned 7 miles (12 kilometers) away. Another two alternatives here are the Middlethorpe Hall And Spa along with the The Black Swan Hotel. 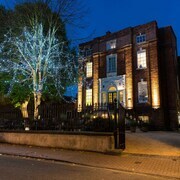 Still looking for things to do? 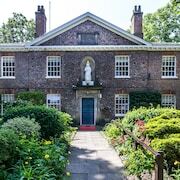 Consider spending some time exploring St. Olave's Church and St Mary's Lodge, which you'll find in Bootham, 7 miles (11 kilometers) southwest of York. 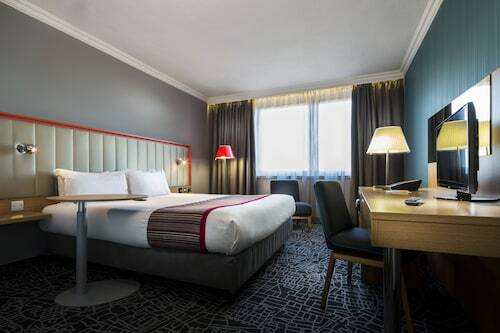 The Best Western Plus Dean Court Hotel and Hedley House Hotel are just some of the convenient short and long-stay options in Bootham. 35 miles (55 kilometers) north of York, is Saltburn-by-the-Sea, which is home to the Townend Farm Bed and Breakfast and The Grapes Inn. The Saltburn Pier and Saltburn Cliff Lift are some of the more frequented places to explore should you visit Saltburn-by-the-Sea. If you are interested by sports and love attending thrilling games you could get yourself to Ponds Forge International Sports Centre, situated 50 miles (81 kilometers) to the south of York. 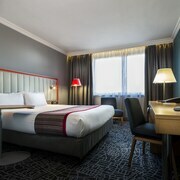 Modern travelers that are keen on locating a hotel close to the stadium, book a room in the The Rutland Hotel or Mercure Sheffield St Paul's Hotel and Spa. 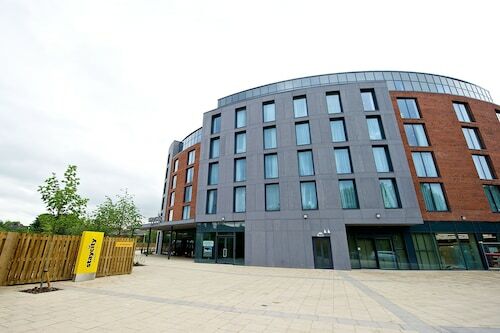 If you're traveling through Leeds Bradford Airport and would like to book a room nearby, try Chevin Country Park Hotel & Spa or The Half Moon Inn. Outstanding architecture and public rooms. Food is culturally representative for the area and deliciously prepared. Staff is professional and friendly. The staff was very friendly and helpful. The room was comfortable and had a nice view. The location is great - right in the historic part of the city. 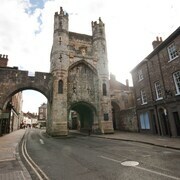 An easy walk to The Shambles, the Minster, the City Walls and all the other attractions. Very unique decor and really fun atmosphere. The price was great and the bed was comfortable. The room was really cold. There were space heaters but they didn’t really work. It was an overall great experience and we would stay again. Nice hotel close to city center and about 10 minutes walk from the train station. Staff was pleasant, room was clean. Would stay again.